My wife and I have just finished watching the surfing documentary, Lost Prophets: Search for the Collective. It is the story of a group of surfers trying to escape the commercialism and competitivism of modern surfing (represented by corporate brands and immensely wealthy sports stars) in the pursuit of a more spiritual and prayerful surfing culture. It is the idea that surfing is about the joy of connecting with the ocean, of enjoying adventure, and of appreciating both the solitude of nature and the communal sharing of one’s passion – surfers can share a unique connection to waves and to each other. My own childhood is filled with rich memories, many of them related to surfing. My first board was a single fin with the brand “Shane” emblazoned on its bottom, recovered from under a neighbour’s caravan while camping. I was joined by my brother Daniel and our friend Cameron long and we spent hours in what seemed like monstrous waves at Currarong (South Coast New South Wales) but which I now know to be mere ripples. Returning home to Berry (north of Nowra), we would catch the 5:15 AM train to Werri Beach at Gerringong. These were the days before swell and the wind information were available on the net, so we would head off with no idea whether or not we would get any waves. The train station at Gerringong is on the other side of the hill, and we would lug our boards to the beach often arriving before the sun had risen. It was a feeling of immense anticipation, hearing the sound of waves and waiting to see what the sun would reveal. Even the disappointment of small onshore slop didn’t stop us getting wet. Sometimes we would wake up the taxi driver to drive us to the neighbouring Geroa Beach. The poor bloke was amazingly generous to us hooligans, who had forced him out of bed and piled into his car, surfboards on our laps and sticking out the window. Some weekends we camped at the beach. Matthew Wright and Shane Murphy (where are these guys now?) were with me one time where there was no surf on the day we arrived. That night we lit a bonfire and sacrificed a can of baked beans to Hughie, the God of the waves. The next morning we had pumping surf – and I’m not sure what theological conclusions we can draw from that! One weekend, in celebration of the end of the school year, I went camping at caves beach with Matthew, Shane and Mark Mulverhill. Mark was not a surfer but came along for the ride, taking to the waves with a boogie board. The swell was huge and a rip was running from the beach out to the point (pictured below). The rip was surprisingly strong and while those of us on surfboards could negotiate the current, Mark struggled, and before long found himself being washed out to sea. Before any of us could do anything about it he had been sucked around the headland and was being pummelled by waves perilously close to the rocks. There was little we could do, and as he was dragged and smashed along we honestly thought he was going to die. One of us (Matthew I think) went to find the police while Shane and I ran along the head land watching in mute horror. 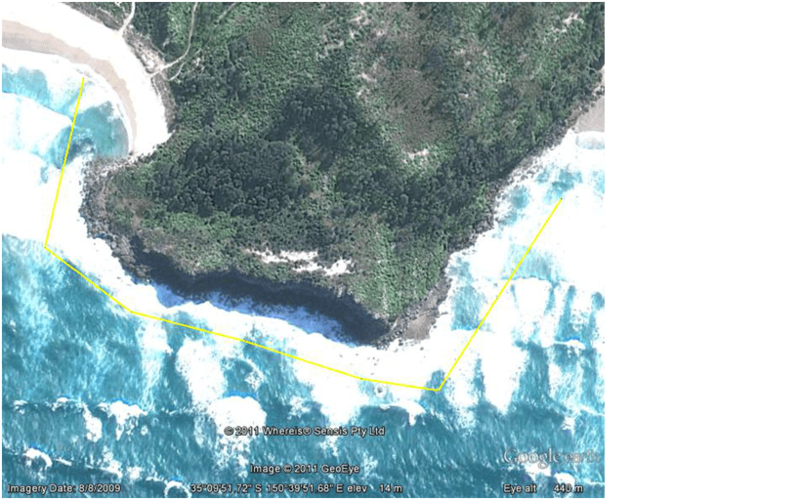 The matter was eventually resolved when the tide carried him around the head land to a neighbouring beach – a journey that Google Earth tells me is only 700 m but that seemed much longer. We rushed out and gave each other teary hugs. I suspect Mark has not spent much time in the surf will since. The day before my wedding I went surfing with my brothers. I fell and smashed my back on the fin of my board and I still have a scar to remember the day. This became for us a tradition; something we had to do before each of our weddings. My surfing adventures slowed with my move to Sydney. I lived inland and could not deal with the crowds at Sydney beaches. In recent years I took up the sport again with vigour. I purchased myself a long board (mal) and this made paddling easier for my “old man” body. I guess this made me a traitor to the younger short- board self but it gave me the opportunity to take a more mellow approach to the waves. 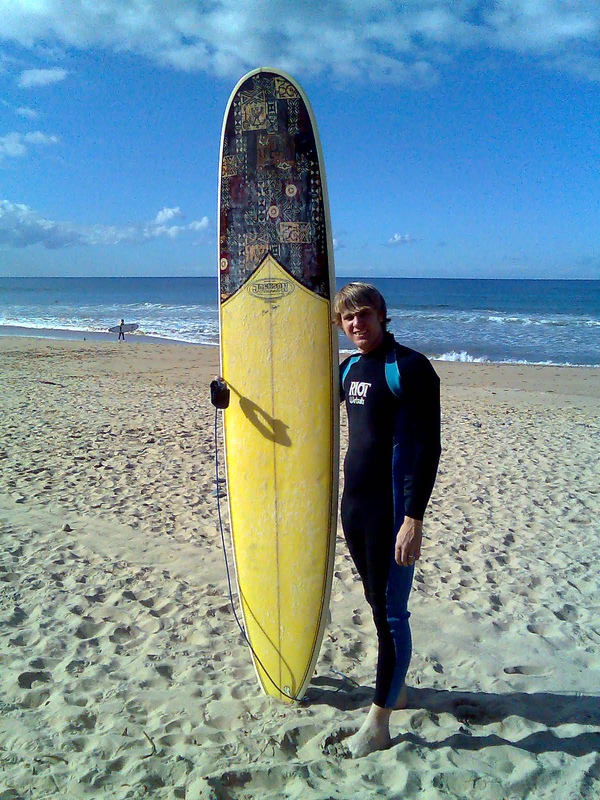 On 7 October 2010 I went for a surf at Culburra with my son. There was a good size swell and an offshore breeze and I had three hours of exhilarating joy in the waves. At three o’clock that same afternoon I broke my neck and became a quadriplegic. Watching the documentary and thinkiong of surfing as a spiritual adventure was something of a challenge. My wife got teary and gave me a hug. I certainly miss the surf – and golf and all the other things go with a body that works. Perhaps more significantly, I regret that I did not make the most of my former opportunities. In the busyness of life I didn’t surf enough. I didn’t pursue the fullness of the spiritual connection with the waves and nature and God at work in and through these things. More than just finding God at church, I think we experience life in the Spirit when we find beauty and when we take the opportunity to glory in its wonder. 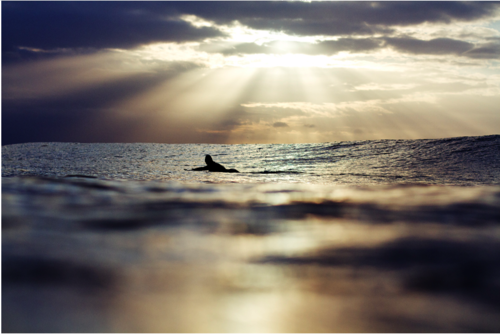 I found that beauty in surfing, but I just didn’t surf enough. Of course I did other things of greater value – loved my wife and raised kids – but I still think I failed to make the most of the blessings of the ocean. And now the time has passed. Such is life for each one of us at some point so don’t feel sorry for me. instead, examine your own life. Slow down. Discover your passion and enjoy its wonder with friends. 9 You who are young, make the most of your youth. Skiing is my spiritual passion – it’s where I feel closest to God. I think I need to go surfing more. I often find myself praying why while sitting out back. Sounds like a great vid. Great post Shane, stirs the emotions. 12 months ago I realised that given where I live I’d be mad not to learn how to surf. The kindness of Tenneil saw a surf lesson for Christmas last year that I’ve only just taken and with a borrowed board I’m away. I’m excited by the times to be had. I’ll catch a few for you mate …. Shane, my child hood memories are very similiar, the good old train to gerringong, and camping at the end of school. Shane, I was only sitting here last night wondering how you were getting on, talking with mum and Dad and I was remembering you getting a new surf board (maybe a birthday present) and you had it in the Nowra pool after training as you just couldn’t wait to have a go, funny the little things we remember about people! Yes you are right we do all need to examine our own lives and make the most of each and every day and feel grateful for all that we have, you attitude is such an inspiration to everyone, enjoy the Christmas break with your family.